Harry Winks rose to the occasion for Tottenham at Fulham on Sunday, and manager Mauricio Pochettino will hope for another rare goalscoring contribution from the midfielder when Spurs take on Chelsea in Thursday's Carabao Cup semi-final second leg on Sky Sports Football. In the Premier League, Winks has touched the ball just seven times in the opponent's area this season, but one of those was to devastating effect on Sunday as his injury-time winner secured all three points at Fulham. "It was a bit of a blur to be honest, " Winks told Sky Sports after the match, with defender Jan Vertonghen adding: "I don't even know what he was doing there." In the absence of Harry Kane (out until March with an ankle injury) and Heung-Min Son (at the Asian Cup with South Korea), and with Dele Alli hobbling off in the 86th minute after scoring the opener, Winks' first goal since November 2016 could not have come at a better time. The stooping header came after he initiated the move in his own half, and it capped off a fine man-of-the-match display for the midfielder, who started alongside Christian Eriksen in a makeshift 3-4-3 formation for Pochettino's injury-depleted side. Winks' winner also proved to be the last of his 106 touches against Fulham, of which 102 were passes at an accuracy of 89 per cent. Importantly for Spurs, 72 of those passes came in the opponent's half, an indication Winks was instructed to play a more advanced role than he has been accustomed to, while the introduction of Eric Dier late on gave him extra license to attack. Erik Lamela sits down with Adam Smith ahead of Tottenham's Carabao Cup semi-final against Chelsea and gives us an insight into the Spurs dressing room. The move paid off and Pochettino revealed afterwards that he had spoken to Winks - so often Spurs' metronome in the middle of the park - about trying to play further up the pitch and add goals to his game. "We were talking in the last few weeks that it's something he needs to improve - arriving in the opponent's box and trying to score more goals," said Pochettino. "That's his second goal in the Premier League. "With his quality, how he plays, in possession he needs to add and improve those two different areas in his game without the ball, be more aggressive - he's doing that and I'm so happy - and of course trying to score more goals, because always for a midfielder if you add goals, like (Ivan) Rakitic and (Luka) Modric, you start to think that you're a top, top player. "I advise all people to watch the [winning goal] and how it started. He recovered the ball in a very deep position, like a full-back, and then how he ran with great determination to score, it was a fantastic example for the players." 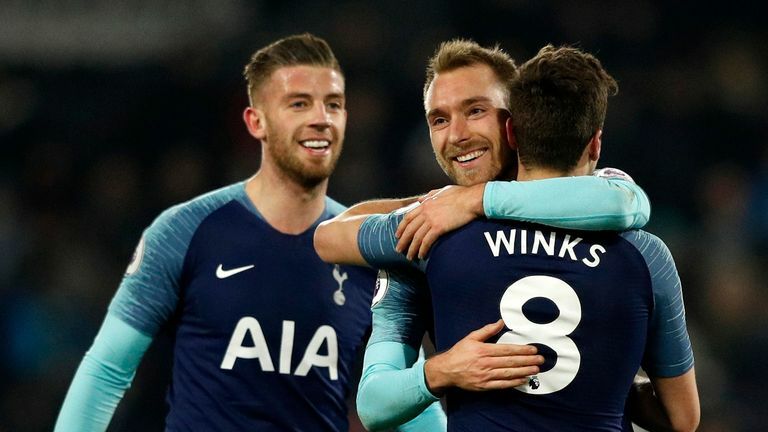 Winks will continue to play an important role for Spurs with Dier only recently returning from injury and Moussa Sissoko out for two weeks, while fellow midfielder Victor Wanyama has been a long-term absentee. Who has the most injuries? Tottenham, Arsenal and Liverpool were among the teams hit by injuries over the weekend - but which club has the most players in the treatment room? With Alli adding to Spurs' attacking woes, Pochettino will be buoyed by Winks' telling contribution at Fulham, and the manager stressed Thursday's semi-final second-leg at Chelsea - live on Sky Sports Football - offers the chance for more heroics as they look to defend their 1-0 aggregate lead. "It's a massive opportunity for another player," the Spurs boss said. "We are going there to win and try and get into the final." With Winks expected to start at Stamford Bridge, the spotlight will be on the player once more. He stepped up to the plate on Sunday, and with a final spot at stake, he will be desperate to repeat the feat on Thursday.